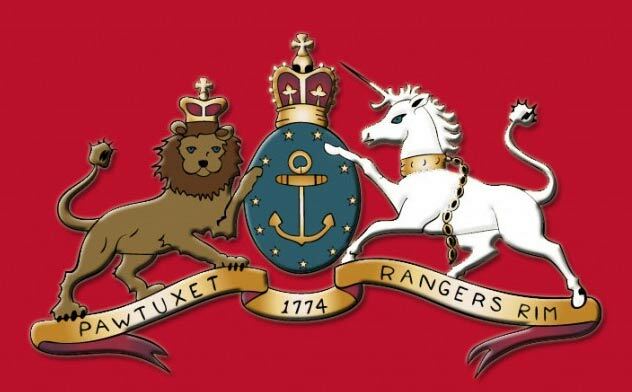 Armory Hall, home of the Pawtuxet Rangers, R.I.M., was built by the State of Rhode Island in 1843 for the Rangers following the Dorr Rebellion. The building, located at the corners of Remington and Bank Streets, on the Warwick side of the Village, is built of “rubble stone” with a smooth cement, or stucco exterior that was scored to look like large stone blocks. The building was later coated with traditional “rough surface” stucco. 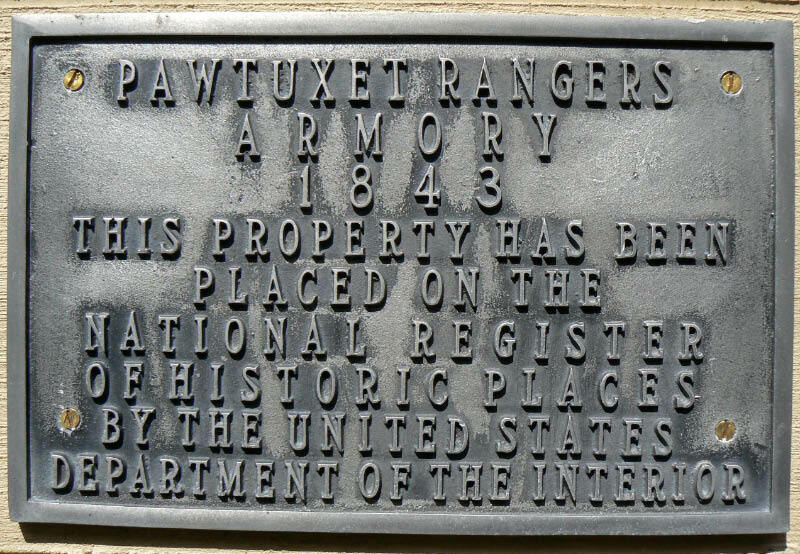 The Pawtuxet Artillery was de-activated in 1847, and the Armory Hall was sold to Harmony Lodge No. 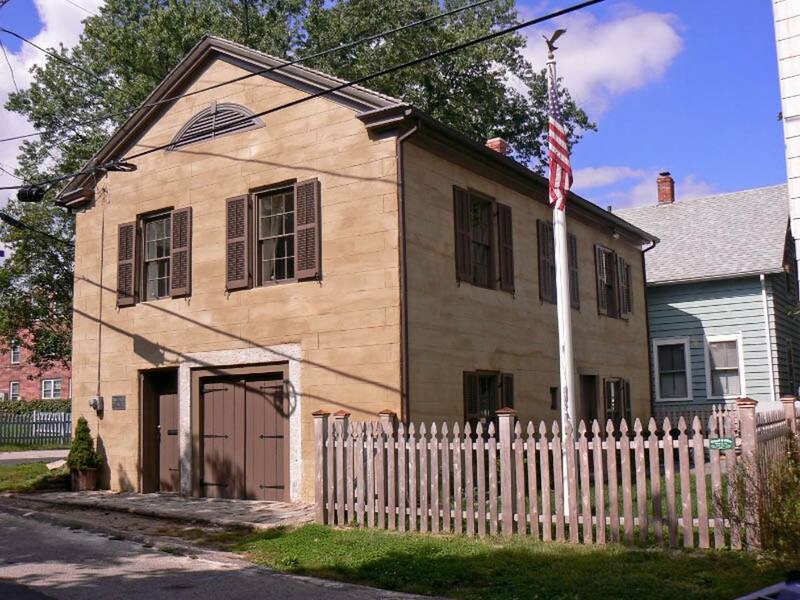 9 of Pawtuxet for their meeting hall. At this time, a second floor was added. The second floor was converted to a Lodge meeting hall, including appropriate moldings, and the ceiling was plastered in a vaulted style and covered with wallpaper reminiscent of the Masonic symbols. This ceiling, accessible through the attic, remains today. The first floor, with the large double doors, was used by the local volunteer fire company (later incorporated in 1891 as the Volunteer Fire Company No. 1 of Pawtuxet) for the storage of their hose cart and other equipment. It appears that an asphalt covering was put in over the dirt floor at this time. The building was sold as a private residence in 1906 and converted into two living areas by Rufus Sprague, whose name still appears on the wall of the building. The Rangers purchased the building in 1985, and began a two-year restoration project. The Armory Hall was re-dedicated on 15 July, 1989 to its original purpose as a military armory. From 95 North or South take the Route 37 East Exit. Take the ramp all the way to the end. You will get off onto Post Road. You will go by Gregg’s on your left, Wal-mart on your right, cross over Warwick Avenue, and at the end of Post Road the Bank Cafe would be on your left. At the end of Post, at a light, you will be facing Pawtuxet Park. Take a right here and Remington Street will be your second right after that turn. We are one block up on the right, on the corner of Remington and Bank Streets.